Chicago’s costly record of police misconduct settlements showed no signs of tapering off in 2016, with the city continuing to pay an average of more than one every other day. The total paid for misconduct lawsuits last year alone would have been enough to more than double the funding for the mayor’s highly touted after-school, summer youth jobs, and youth mentorship programs this year. The city paid nearly $32 million in 2016 for 187 misconduct lawsuits and spent $20 million more on outside lawyers to litigate the cases, slightly more than in the previous year and well above what the city budgeted for these settlements, according to new data analyzed by the Chicago Reporter. The 2016 cases, as well as those paid in 2011, have been added to the Reporter’s Settling for Misconduct database, which now contains information on more than 940 misconduct lawsuits. 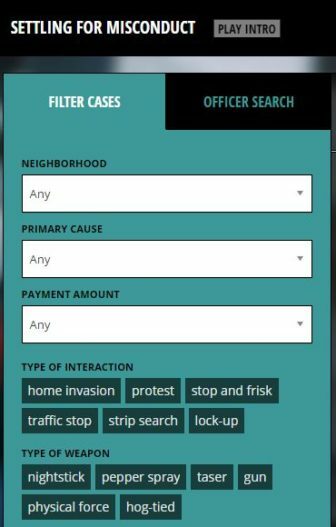 The database is an effort to bring transparency to the financial burden of police misconduct in Chicago. Overall, Chicago spent more than $280 million on misconduct lawsuits from 2011 to 2016, plus another $91 million for outside lawyers to help defend police officers in those suits. The city routinely fails to budget enough money for settlements, forcing the City Council to borrow to pay them and adding significantly to taxpayers’ burden. The Reporter analysis shows that more than 90 percent of the 2016 cases ended in a settlement, which means the city and police officer do not admit guilt or liability. But the cases follow many of the same patterns as those that were paid in previous years. Most stem from everyday encounters between police and residents of African-American and Latino neighborhoods: About two-thirds of the cases occurred in majority-black census tracts. Three-quarters of the cases alleged excessive force, false arrest, or both. Nearly one-fourth claimed that two or more officers conspired to violate a person’s rights. Police shootings, not surprisingly, are among the most costly cases. The city paid more than $12 million last year for 14 police shootings, seven of them fatal. In an additional 31 cases, officers allegedly drew their guns and pointed them at people, including, in some cases, children. Since the Reporter first published police lawsuit data last June, the city has come under increased scrutiny for the high price tag on misconduct and its failure to analyze these cases for trends. First, the city’s inspector general, Joseph Ferguson, urged Mayor Rahm Emanuel’s office to create a chief risk officer position that would be responsible for analyzing claims against the city, including misconduct lawsuits. But the mayor’s chief of staff, budget director, and comptroller replied in a letter that the city wouldn’t look at police misconduct cases until after the U.S. Department of Justice completed its investigation of the police department. The delay, according to former justice department officials and other experts who are familiar with DOJ investigations, was unnecessary. When the DOJ completed its investigation in January, the DOJ’s report reiterated the IG’s recommendation that the city should “review settlements and judgments on a broader scale to spot for trends, identify officers most frequently sued, and determine ways to reduce both the cost of the cases and the underlying officer misconduct.” The DOJ also cited the Reporter’s database and chastised the city for its lack of transparency about police misconduct lawsuits. Despite these reports, the city has taken no steps to report on or analyze misconduct lawsuits. Ferguson said he was not surprised at the city’s inaction. Ferguson said this type of analysis will be one of the regular duties of the new deputy inspector general for public safety, who was approved by the City Council in April. He said he hopes that office, led by Laura Kunard, will be fully staffed by the end of the year. Lightfoot became animated when asked why she thinks the city hasn’t done anything to address the issue despite concerns raised by her task force, the inspector general, and the Department of Justice. The impending increase will disproportionately impact lower-income blacks and Latinos who have been driven out of mainstream banking in Illinois. Can’t help but wonder how much went to fund gang activity. Oh you could help it if you tried. how to pay for this — the city budgets what it will need for police salary and pensions. Take the lawsuit money from those line items so that the bad cops pay for it. And the god cops who look the other way will pay for it too. 940 lawsuits, there must be a lot of good cops looking the other way.